By far our bestselling colour, black has enjoyed unrivalled popularity due to its matchless ability to fit any environment and décor. With a versatility that cannot be denied, it’s well known for going with anything and everything and is ideal if you have a mix of different colours in a room, tying them all together whilst complementing each to the full. 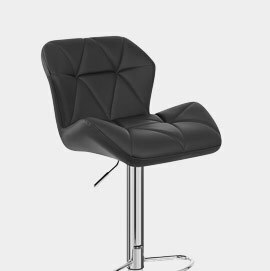 Whether you’re after a sophisticated, elegant look or prefer a more simple, down-to-earth vibe, our vast array of stylish black bar stools cater for a wide range of styles meaning you’re sure to find the perfect match for you. "Whether your home’s a modern space, or a more traditional interior, black bar stools are a fantastic choice. Effortlessly chic and super stylish, they enhance almost any colour scheme, plus they're perfectly practical. In leather, faux leather, fabric or ABS, choose black bar stools for a fashion-forward look." Whilst certain colours go in and out of fashion, black will always be in trend. With a timeless appeal, it will without doubt look just a good now as it will in five or ten years time. Whilst a vibrant purple or zesty orange may be a little “out there” for some people, this is a safe and widely accepted choice that won’t offend different people’s tastes. Versatile and adaptable, it will never clash with another colour, but will contrast nicely against a whole host of other shades. 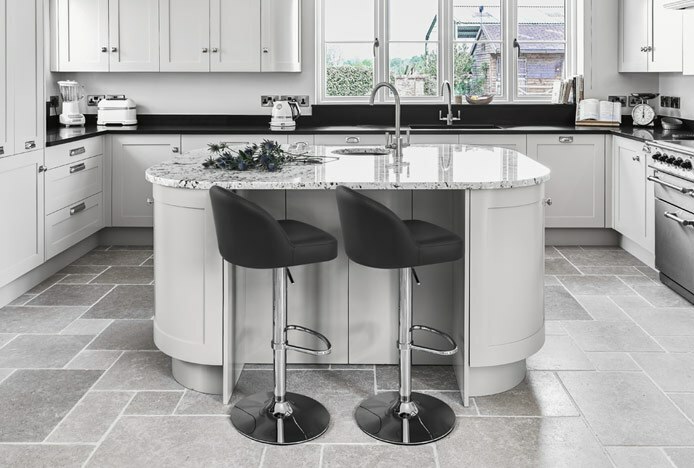 With the rising trend of matching kitchen seating to work surface colour, coordinating black bar stools and worktops creates a striking contrast against lighter cabinets. However it can appear overpowering in smaller spaces if not used wisely. 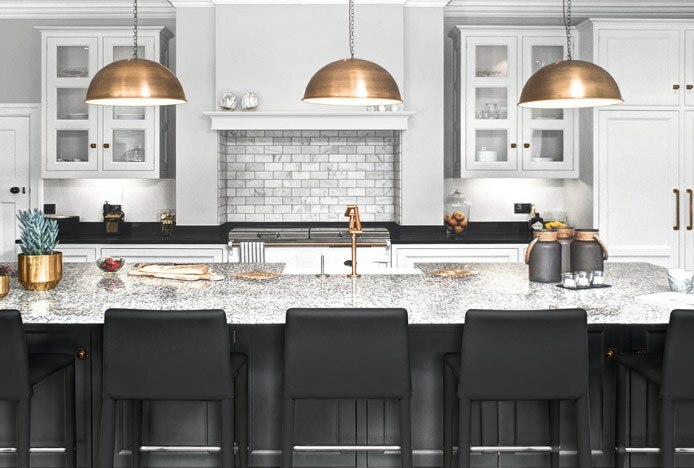 When buying darker stools for a smaller kitchen or commercial environment, remember that less is more. Opt for low to mid-high backrests so that the dark colour does not dominate, but compliments its surroundings. Infamously practical, black does not mark like lighter shades meaning it’s far more likely to last longer as it won’t need to be replaced. Not only is it great in commercial environments where heavy use makes it more susceptible to wear and tear, but it’s just as useful in domestic environments with sticky-fingered children or messy pets. Whilst new blue jeans can leave a tint on light coloured seating, black is renowned for hiding a multitude of sins. Our bar stools are available in an assortment of different seat materials, each producing a slightly different yet equally timeless look. Choose real leather for that exclusive luxury touch, or faux leather for an inexpensive yet stylish alternative. For a modern funky vibe why not try high gloss ABS, or for striking style opt for state-of-the-art acrylic. Whatever seat material you select, black will produce a stunning contrast against a metallic steel frame for a bold statement. Sparkling mirrored chrome reflects the light and acts like a mirror, an effect that is heightened when set against a darker shade. This is great for bright contemporary settings such as exhibition spaces, where you want your stools to draw in the eye and stand out from the rest. The Duo is a great example, with decorative chrome edging on the seat for added contrast. Whilst having a more matte finish, brushed steel creates a similarly distinctive effect and is often chosen for its sleek and sophisticated chic, as modelled by the Rochelle. For a more traditional look, why not choose a wooden frame. The seat on a light oak or warm walnut will create an eye-catching contrast, or if you’d prefer a more uniform and consistent look, stylish designs such as the Charlotte use a painted satin finish for a modern take on a traditional design. 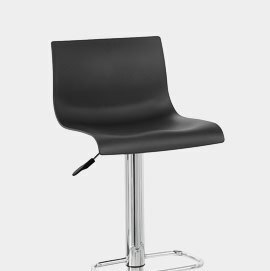 With so much to offer, our range of exquisite black bar stools could be just what you’re after. 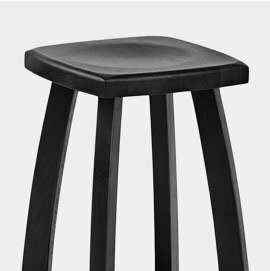 To get started, why not take a look at the list above, or, use the button below to browse our entire collection of black bar stools. The definitive guide to choosing the right colour stools for your and your space..
Rediscover brown stools, and find out how they can work for your home..